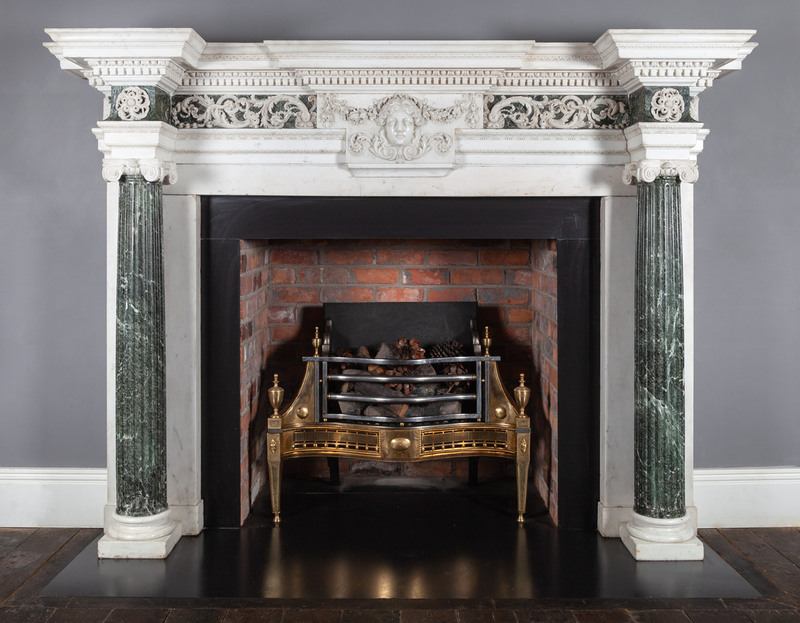 A monumental white statuary and green Verde Antico marble chimneypiece designed by Isaac Ware (1704-1766). The frieze having curved panels of Verde antico, overlaid with foliate scrolls of statuary marble. The centre plaque which is dog leg in shape depicts Flora, goddess of flowers and the season of spring, flanked by swags of oak leaves and acorns. 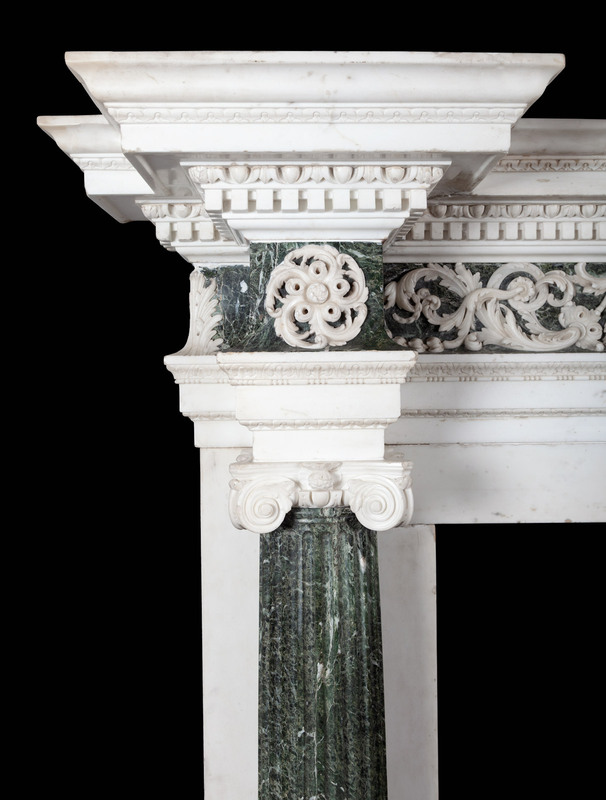 The full tapering columns of Verde Antico marble are fluted and capped with finely carved ionic capitals. 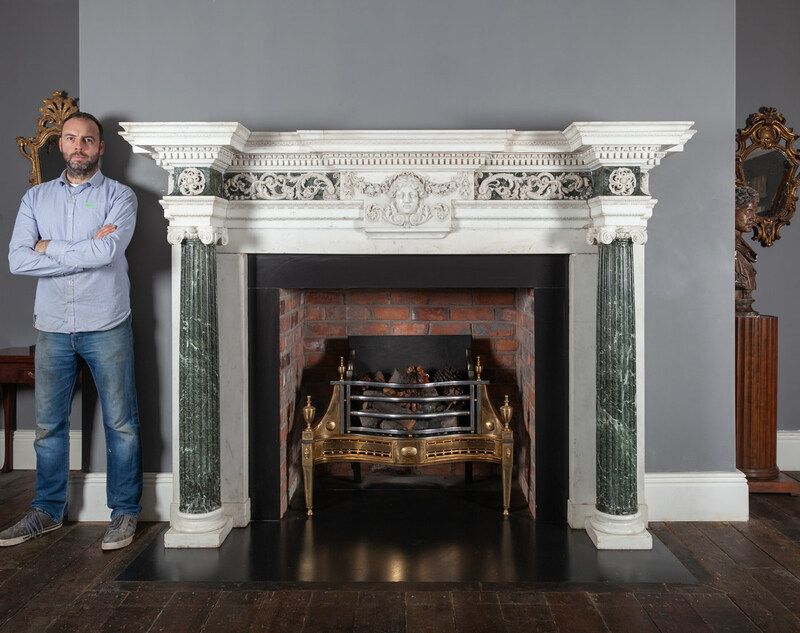 This fireplace is considered to be one of the finest and most important 18th century fireplaces to come to the market in recent years. Ryan and Smith have acquired it from the Chrysler Museum of Art, Norfolk, Virginia. 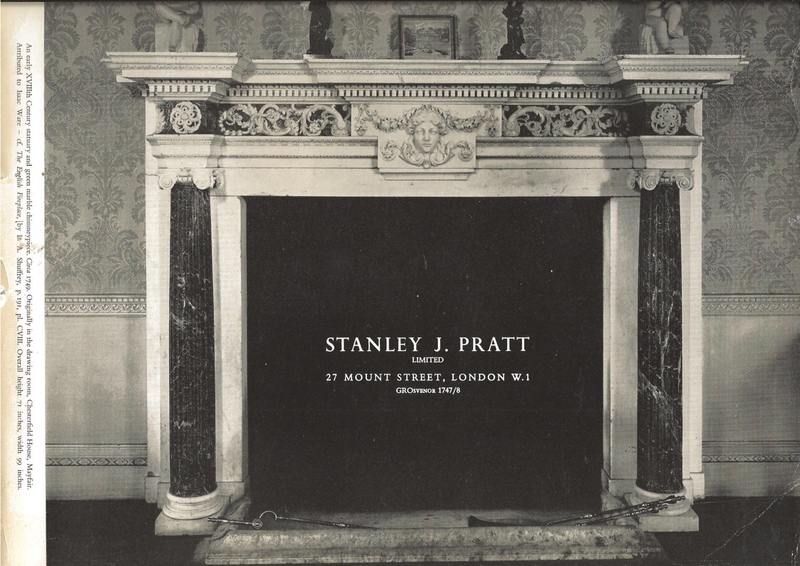 Walter P Chrysler Jr., renowned collector of antiques and fine art, purchased the fireplace from the well-known Mayfair antiques dealer Stanley J Pratt Limited, 27 Mount Street, London. The chimneypiece is illustrated in Connoisseur magazine 1963 Vol. 154, no. 620, which states “Originally in the Drawing room of Chesterfield House Mayfair, attributed to Isaac Ware”. Isaac Ware’s is an interesting story. Born into poverty and working as a chimney sweep by the age of 8, he was adopted by Richard, 3rd Earl of Burlington, who reportedly saw his chalk pavement drawings and recognised his talent. Aged 17, whilst still in Burlington’s household, he was apprenticed to Thomas Ripley, architect and surveyor in the Royal Office of Works, and a great favourite of Sir Robert Walpole, for whom he worked at Houghton Hall. Under the aegis of Burlington he became a devotee of Palladianism, publishing ‘Designs of Inigo Jones and Others’ (1731 and 1743) and a scholarly translation of Palladio’s ‘Four books of Architecture’ (1738) which he dedicated to Burlington. His most important work however was ‘A Complete Body of Architecture’ published in 1756-57, which became a standard work on Georgian architectural practice and theory. 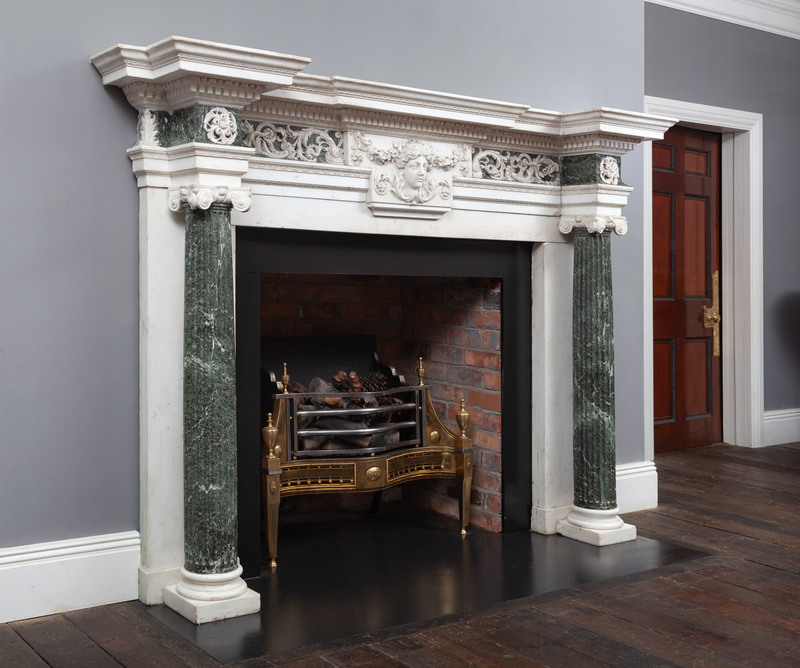 This Palladian ‘Ionic’ chimney piece by Ware derives from a design by Inigo Jones (d. 1652) which was subsequently re-worked by both Isaac Ware and William Kent (d. 1748). Ware’s chimneypiece is featured in L.A.Shuffrey’s book, The English Fireplace, London, 1912, plate CVIII. 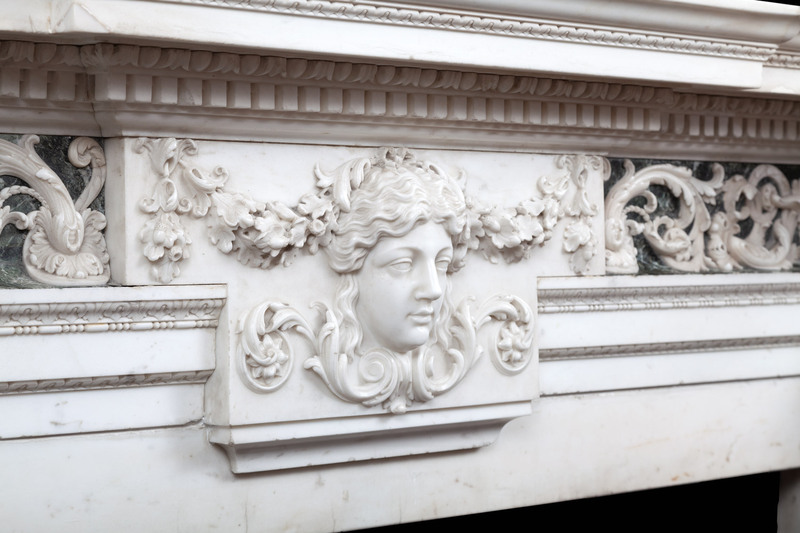 Although Shuffrey describes the chimney piece in “The Drawing Room at Chesterfield House” as being of Siena marble, H. Avary stated in a Country Life article about the property that “the only one (chimney piece) of that marble (gallo de sienna) is of the French type”. 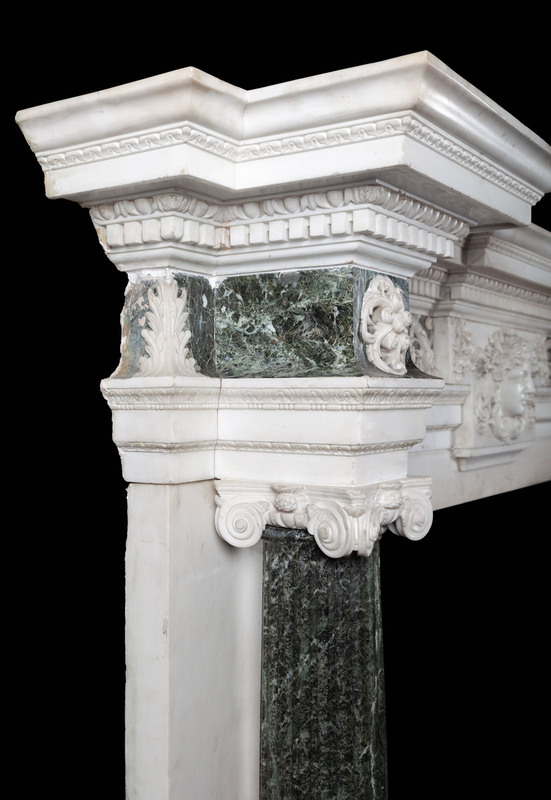 For despite Ware’s strong Palladian inclination, the 4th Earl was a committed Francophile and this taste was reflected in much of the interior design of the house, though clearly not in the case of the design for this chimney piece. Ware illustrated chimneypieces with tablets of related design to that employed in the ornament of the present example in his work, A Complete Body of Architecture, Book I, 1756, (pls 89 & 94) and writes at some length why he favoured this shape for the tablet and considered it so appropriate for chimneypieces ‘of all its parts, the central tablet is the principal: that will attract the eye first, and detain it longest; and consequently upon that it is needful to bestow the greatest attention. With respect to its form, that of an oblong square would first come into the architects thought; but something may properly be added to it… To this purpose, in the present instance, let the tablet drop into the upper member of the frame only in the middle; the two side parts being of the breadth of the freeze. This will give the tablet itself a more handsome shape than that of a plain square, and will suit it very happily to receive the ornament that is most proper for it. This may be of various kinds; but there is none so fit as a head;… and leave almost necessity of short festoons on the two sides…’ (ibid. Book VI, Ch. XXXIV, p. 601). Ware also writes of his preference for the marble utilsed in the present example ‘There are some of the old marbles much more fit for the purpose; the true verde antique, will be a glorious addition in this place, its elegant green being altogether unlike the whole; and upon this the ornament well wrought in the same statuary kind will be very elegant’ (ibid.Book VI, Ch. XI, p. 567). Although there is no record of the sculptors that Isaac Ware instructed to undertake his designs, one distinct possibility is James Richards (d. 1767) appointed Master Sculptor & Carver in Wood, Office of Works to George I after Grinling Gibbons demise. James Richards was Isaac Ware’s father-in-law, and Ware’s son, Walter James Ware, was employed in Richards’ workshop. 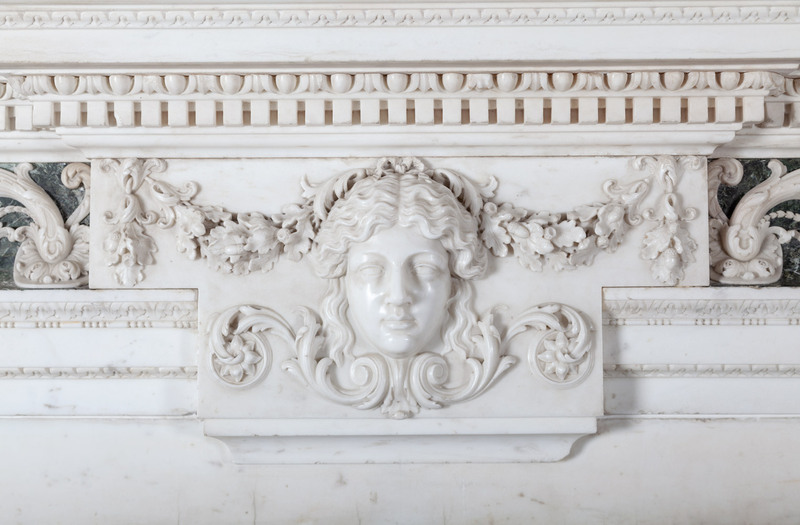 James Richards is documented as having carved ornaments on chimneypieces at Kensington Palace and was employed by William Kent to execute carved stonework for the Horse Guards and at Lord Pelham’s house at 17 Arlington Street. The overmantel in the King’s Gallery at Kensington Palace is also believed to have been by Richards, again working for Kent (Ed. Geoffrey Beard, Christopher Gilbert, Dictionary of English Furniture Makers 1660-1840, Leeds, 1986, p. 742). Ware’s close family ties to Richards make it highly probable that Ware would have utilised Richards’ workshops for the execution of his designs. Aside from Chesterfield House, the magnificence of which is revealed by a rendering of its interior featuring twin staircases, Ware was responsible for a number of country houses, including Wrotham Park, Hertfordshire and Clifton Hill House, Bristol.